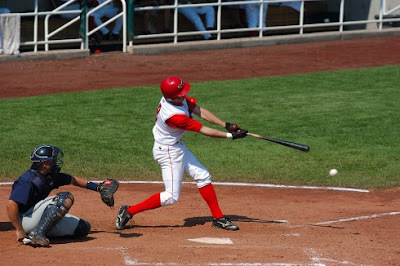 Optometrists say that afternoon games played under bright and sunny skies can make hitting difficult for certain light-sensitive players. Texas Rangers outfielder Josh Hamilton hasn't had much trouble slugging like an All-Star during night games this season, but has struggled mightily during day games, exaggerating a career-long trend. When he blamed his blue eyes and light sensitivity for the discrepancy, media reports quickly examined the statistics of other light-eyed players and found little difference between most batters' performances in day and night games. But according to some vision experts, there are legitimate reasons why a player might hit worse under the sun than under the lights. "Believe it or not, there really is a whole lot of science behind it," said Dr. Kevin Gee, an optometrist and director of the Sports Vision Performance Center at the University of Houston. "Lighter eyes just don't absorb light the way darker eyes do." Abnormal sensitivity to or discomfort in bright light can come from many causes, said Dr. Keith Smithson, the team optometrist for the Washington Wizards, Washington Nationals and D.C. United. He noted several possible causes of sensitivity, including light iris color, but also large pupil size, cataracts, pathologies within the eye, side effects of certain medications and genetic factors. Vision is obviously extremely important for major league hitters. Light enters the eye through the pupil, which Gee said is generally smaller for darker-eyed people than those with light eyes. Like the aperture on a camera, the size of the opening impacts the focus and depth of vision, both of which are crucial when tracking 95-mph fastballs. "A fast moving ball should be seen better in a smaller pupil to minimize aberrations," said Gee. He explained that there is a delicate balance between letting in enough light to see, but not so much that players end up being light-sensitive. Both Smithson and Gee have worked with numerous professional athletes, including those suffering from sensitivity to light, and have found that sunglasses or colored contact lenses are a typical way to solve the problem. However, overcorrecting by using sunglasses that are too dark can impair vision. "I have seen my MLB athletes with literally a small suitcase full of different sunglass tints from their sponsors to pick and choose from to find the right tint to match the game conditions that day," said Smithson. The clarity of a player's vision -- called visual acuity -- is not the only important quality to track for baseball players. So is contrast sensitivity. Smithson said he measures this in order to interpret "a ball player's ability to pick out a white target, a baseball, against different backgrounds." Additionally, sensitivity to bright light can be caused by very dry eyes or allergies, Gee said. Smithson noted that the first stage of addressing a player's light sensitivity problem would be to rule out pathologies. After that, he would explore managing issues created by glare, reflection, and bright light. "This can be achieved by finding the correct tint to be used on glasses or contact lenses, also examining the potential benefits in polarization to eliminate glare," said Smithson. "It is also possible to lessen light sensitivity and glare using pupil constructing medications if the photophobia is caused by large pupil size." The Rangers host the Florida Marlins this weekend, but they'll be playing under bright artificial lights, not the blaring sun. Hamilton's next scheduled contest under the midday rays is July 10.